The team look forward to welcoming you to Westerham Brewery where you will learn about the brewing process, sample some of our award-winning ales, and immerse yourself in an ages-old experience, all achieved with up-to-the minute technology. There are plenty of opportunities to ask lots of questions, and truly understand the process from the raw materials of water, hops, malt, and yeast to locally brewed, top quality real ales! Exclusive Private Party Ideal for larger groups of 20 or more, available out-of-hours on selected evenings, usually Tuesday, Wednesday or Thursday. £200 for up to 20 people includes brewery tour and 5 x 1/3 pint beer tasters (for additional guests, please add £10 per person). Food can be provided at an additional cost, buffet menus are available or Street Food supplied, subject to availability. Open Evening (Brewery Tour and Tasting) Ideal for a smaller office group, join the fun at our open evenings, with local street food (optional), informal tours at 7:30pm and 8:30pm. £10 per person includes 9 x 1/3 pint beer tasters. Every first Thursday of the month, 6.30 – 9.30pm. Please check the main events page for more information about specific Open Evenings. Food Pairing Tour 1½ hours, available on selected Saturdays and Sundays starting at 12:30pm and again at 2:30pm. £200 for up to 10 people includes a welcome drink, talk and tasting samples of food and beer. General Tour & Tasting (available during normal opening hours by prior arrangement) This is not an exclusive event and access into the brewery may be limited. 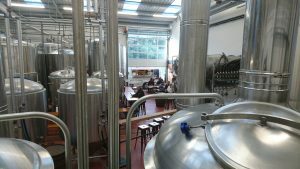 It will include a talk about the Brewery & brewing processes and tasting samples. £100 for up to 10 people includes 5 x 1/3 pint beer tasters (for additional guests, please add £10 per person). To book or discuss your requirements please call Piers on 01732 864427 or email retail@westerhambrewery.co.uk. We take quality and safety issues very seriously. Please read our Visitor Guidelines (click here) and we ask that all members of your party adhere to these at all times. Each member of the party must sign the document prior to the tour commencing. Please be aware that our brewing schedule can change at short notice and it may be necessary to reschedule your day.